Nationally: in order to be considered for national in-store distribution, you need to pass several (many) checks and your book needs to go to their book buyer who is super particular about what she buys for the stores. Understandably. Product needs to move fast in Costco which is why you may see something one week but not the next. Books that are given national distribution meet a certain criteria - most of it having to do with sales and movie tie-ins. For example, if you go to Costco now you'll see lots and lots of copies of Gone Girl, which is out in its new redone movie-cover format ahead of the movie release. Same is true for Outlander, which is now on Starz. Big sales mean big exposure at Costco. If your book doesn't meet this criteria, take heart. There are other options. Select Store Distribution: In some cases, the Costco buyer will take a chance on a title for a different reason. Maybe it's not a mega-national bestseller but it does have a certain appeal based on audiences across their stores. In this case Costco may decide to purchase a select number of books to test it and see how it does. We had a book this happened to. 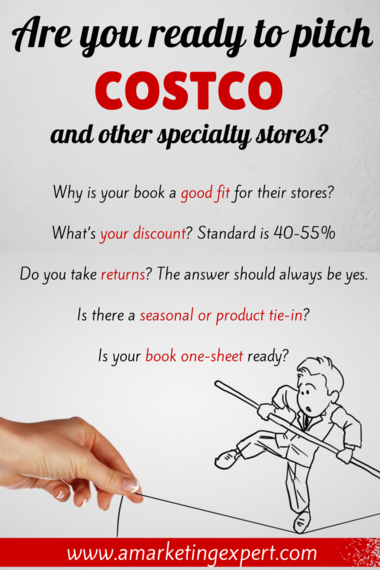 Costco purchased 800 copies across four stores in certain areas that had a documented interest in this type of material. If the book sells in those areas it can get restocked and, possibly, wind up across the country, too. Select, Single Store Distribution: Most local managers have the ability to make regional buys; you just have to ask them and pitch them in the right way. Authors often say to me, "Wait, all I have to do is ask for my book to get stocked locally?" Well, yes and no. It's easy but also requires some advanced work. 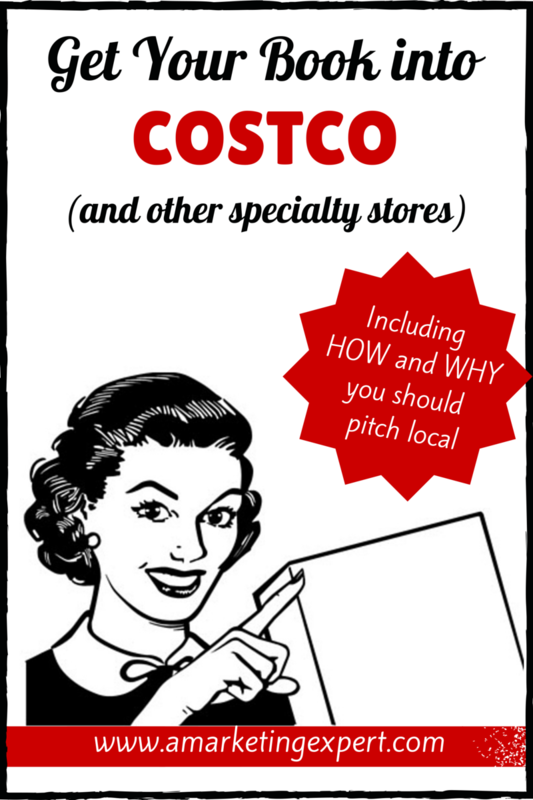 While one store may not seem like a huge splash, having your book in Costco is a fantastic opportunity and it's far easier to get your book into your local Costco rather than going through the rigors of a national pitch. Keep in mind that their book buyer is inundated with books across the board, from all of the major publishers, so looking locally might actually be a better option. Also, pitching yourself locally is not difficult and requires only that you ask the right person. But beyond the "ask" here are some things to consider. I've coached authors on getting picked up by their local Costco and, in almost all of the cases, this method has worked for them. What you're doing is going into your local store and asking the manager (or whoever they direct you to, it could be one of their buyers) if they'll carry your book for a certain period of time. They won't take a ton of copies, maybe five, and there will be a certain window that they'll need to move those books. Meaning they don't want books sitting around forever in the stores. But you can use this technique to get your book into Costco, and this same formula works for other specialty stores like Hallmark, Bed, Bath & Beyond, The Container Store, Home Depot and other big box retailers that carry books. 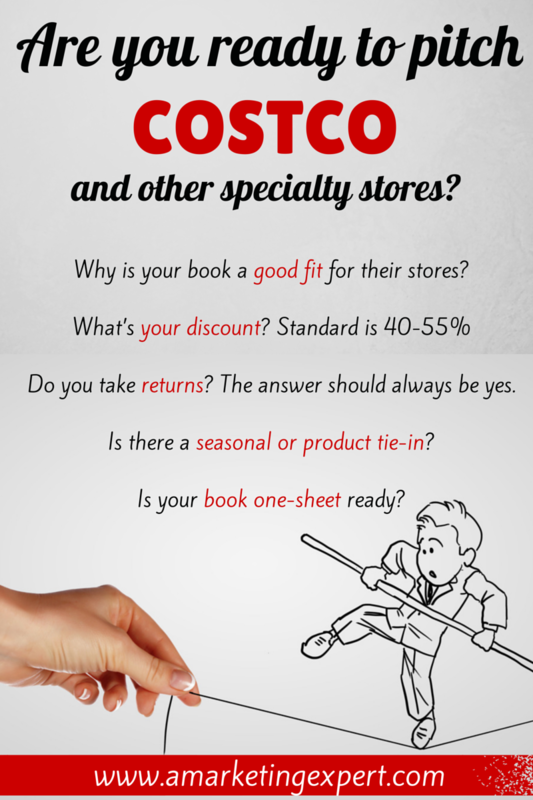 Why your book is a good fit for their stores. Is it Really a Good Fit? This is a big question because though in most cases the answer is yes, if you're pitching any other retailers like The Container Store, etc. the answer might be no. So be ready with your pitch about why the book is great for their store. The wrong answer is: because I'm a local author. The right answer is: tell them how this book ties into their specific consumer market. Are there a lot of other books on your topic, have you seen them turn over a lot? Meaning that they keep selling out of these books and replenishing them with similar themed titles? For example, Costco carries a lot of trade paperback, general and genre fiction. These books have a high turnover rate in their store and if your book falls into this category, it could be a great fit. But depending on the area you are in you may also see a lot of fitness books, cooking books, children's books, etc. Is There a Seasonal Tie-in? Seasonal tie-ins are huge in every store, but this is especially true for Costco. Seasonal tie-ins don't always have to be holiday related but could also have to do with Spring planting season, January fitness, etc. Make sure you know your seasonal tie-in (if any) before you walk into the store. Is There a Product Tie-in? Let's say you're at Costco on a particular Saturday and you see a whole series of decorating items such as frames, fancy curtains, newly acquired throw pillows, etc. Your decorating book would fit right in with that, wouldn't it? This is a great opportunity to pitch your local store and let them know that you are aware of their new push for more home goods and your book could be a nice incentive to get their customers to buy more. The same is true if you see products related to health, home cooking, home making, wine tasting, virtually anything the store is showcasing can be mentioned as a nice tie-in. This also tells the manager that you know his or her store and they like that. You've done your homework! Everyone is busy. Have a book one sheet designed or design one yourself that has all of your book info on it. It should have reviews, endorsements, sales numbers, and anything that could impress a buyer. Think: one-page resume. You should know your terms prior to going into the store or, at the very least, be really clear on your bottom line. If you can't see yourself giving them 40-55% of your book sales then don't even bother going into the store. They are a retailer and need to make a profit, too. Having this kind of exposure is tremendous, I would never turn it down. If you've ever been in Costco on a Saturday, you know what I mean when I say "pick your day;" in other words: don't pitch this on a busy weekend or any time after Black Friday. Find a quiet day, maybe a Monday or Tuesday when the stores typically don't have food tasting set up (generally, food tasting is set up Wednesday-Sunday and brings in a lot of "samplers" which adds to the crowds). If you read this and think: I could get the book into Costco before the holiday shopping season! Then I suggest you leave now and head to your local store. Buying seasons for these big stores start very early and it's likely they won't even be able to get you into the store in time for Black Friday or any days leading up to Christmas. But you can ask them, certainly, just be prepared that it likely won't happen. So let's say that you get your book into your regional store and it does well, so well in fact that they keep stocking it. Could you get it into other Costco stores? Yes, you can but again, stick to regional markets initially. Once you have a track record, you could start picking stores outside of your area and driving distance. I know an author who did this with regional "about" books. The books were all about the local area, great ideas for staycations, etc. They were picked up by one store and did so well that several others in the area started stocking them as well. Some Costco stores will let you do a book event in their stores, but this isn't for all stores. When you talk to the manager see if they'd be interested in hosting you for a signing, too. You may run into this: Costco does not want books from self-publishing houses such as CreateSpace, Author House, etc. This, I've been told, is because these authors do not do their homework. The books aren't vetted, edited and often have poor covers. My book (Red Hot Internet Publicity) was published by CreateSpace and when I showed it to the manager, he couldn't believe it. He said, "Sure, we might consider it." So what this means is that it's not always the publisher but the book. If your book looks self-published you likely won't get into the store. If you don't think you're a good match for Costco, consider other big retailers in your area. I've placed books in Hallmark, Fry's Electronics, a local coffee house, and even years ago in a BlockBuster video - all of these stores local. Most authors think big and national for their book stocking and while that's a great option, it's only open to a select few of us.